About 4 months ago, I wrote about a specific type of canine heart disease (dilated cardiomyopathy, DCM) and the recent concern over its association with diet (pet food). This past week a commentary appeared in a veterinary journal on the subject . It was important to see what is considered expert opinion and have a peek at the results of a survey on this concern, as there’s no doubt it’s a complex issue with serious canine health impacts. 2) there is a dearth of peer-reviewed studies, articles or commentaries on canine nutrition, and, 3) there are myriad complexities (and lack of clarity) when it comes to pet food formulation, manufacturing and sales. The commentary also introduces new terminology (i.e. boutique or exotic diets) to the pet food dialogue. I’m not convinced these terms assist with causation of concern (with respect to cardiac disease or any other). I’d also guess they further cloud a complicated issue (and for me at least, conjure images of fancy French shops) …vs. convey what is (or isn’t) known about these diets and why they may be associated with DCM. The connotation of boutique, i.e. ‘perceived as high-end’, is hard to miss as well…. At present, we simply do not know why (or if) these diets may be linked with canine DCM…and there is much speculation on cause, i.e. low taurine, reduced taurine precursors (i.e. methionine and cysteine), deceased bioavailability, increased (high) fibre preventing enterohepatic binding and recycling, increased taurine loss via the gut and potentially a heightened breed susceptibility…or the association may be naught, i.e. there isn’t one. After all, …a LOT of dogs eat diets containing these ingredients (or ingredients in the speculated proportions), and it appears that the vast majority are unaffected. So, what’s a dedicated dog-owner (or DVM) to do? Ask (or keep asking) the tough questions about the diet your dog (or your client’s dog) is eating, be aware of this concern and critically evaluate what information is available, and after a thoughtful dialogue on what makes that dog unique (e.g. risk factors, susceptibilities) and what the diet(s) in question does (or doesn’t) contain…make an informed decision (together) on what is best- for that dog. We may still have a lot to learn about pet food, K9 heart and overall health & nutrition, but in the meantime, we can work together in a collaborative way to try and keep dogs safe- and maybe even learn more about what they might (or might not) need in the process. Quibbles about kibbles...what does 'diet' mean? I spend a lot of time talking about food. And while it’s true that I enjoy a good meal and a glass of wine…it’s typically dog (or kitty) kibble in the context of a veterinary visit that I am talking about. Those who’ve stumbled on this blog before (n = blood relations), have read my mention of definitions and how these can vary markedly between individuals. As another example of this, the word ‘diet’ is defined by most of us who practise clinical nutrition as everything the dog or cat in question consumes in a typical week. In addition to the bulk of the diet (usually kibble), this encompasses treats, supplements, snacks and whatever other ‘little something’ he or she might get from his/her owner, the floor, grandma, etc. However, the word ‘diet’ can mean something rather different to the average pet-owner when asked, ‘what does your pet eat?’ and due to my disinterest in quibbling (and desire for brevity) I’ll leave the variations of responses to your imagination. To try to get everyone on the same nutritional page, and because I try to teach my students how to be efficient and consistent (aka I’m a slacker and compensating for poor detail-oriented task skills), I typically advise obtaining pet diet information via a nutrition history-questionnaire. These types of questionnaires let me know what the pet is eating (the whole diet) and their activity level. The rest of the pet’s nutritional assessment (weight, body and muscle condition score), other history and physical exam helps me figure out how they are doing with their current diet/exercise. Putting all that info together allows us (vets) to provide recommendations for ongoing care... However, the first step in any type of planning is obtaining information, and that (i.e. pet specific nutrition information) can vary dependent on where you practise and who is coming to your veterinary clinic. Sample of clients visiting the small animal Atlantic Veterinary College Teaching Hospital from June 8th to July 4th, 2018 were invited to complete a paper questionnaire. Descriptive statistics were used to evaluate questionnaire data. Total of 143 clients were invited to participate- 140 agreed to participate, with 106 pet-owners returning the questionnaire. Surveys that were <50% completed were excluded, providing a 71% response rate (n=101). This is wonderfully high level of interest, cooperation and response. A variety of responses were recorded in response to ‘What does your pet’s diet consist of in a typical week?’ The majority of responses to this question were similar to other studies of this nature; however, total raw food intake (commercial, homemade, treats) was 30%. This result is higher than other studies of this type and VERY important information for hospital infection control planning and prevention of disease transmission (e.g. salmonella) to other pets and staff. As in other studies, pet-owner interest in the topic of nutrition and diet for their pet is high. Again, similar to other studies while pet-owners indicate a desire to speak about nutrition this isn’t something that appears to be occurring regularly during visits to the vet clinic, i.e. over 20% of the time it isn’t happening, and it’s hit or miss about half the time. Pet-owners varied in their interest in having their veterinarian discuss their pet’s exercise requirements. Responses to this query were as follows: somewhat agree that I’d like my vet to talk about my pet’s exercise needs (36%), strongly agree and want vet to discuss (27%), felt neutral about having this discussion(26%), strongly disagree and do not want to talk about exercise for pet (8%), somewhat disagree (3%). This was an interesting result and worth exploring further to assess differences between cat vs. dog owners, and whether things differed between reported exercise (amount, frequency) and interest in exercise related discussions. One subject (along with Lyme disease), that tends to stir the pot and set it to boil, is the topic of pet-food. And it seems that with some regularity (i.e. every 2-3 years) veterinary researchers and nutritionists stumble upon something that is lacking in (or being added to) the diets we feed our dogs and cats that can make them sick- particularly if they happen to be a certain breed (or species) with a heightened nutritional sensitivity (or susceptibility), e.g. a need for taurine. Right now, there are pet-foods for sale on grocery and pet store shelves (being manufactured for, purchased and then fed to dogs) that are actively being investigated by the FDA. The feeding of these diets to over 80 different dogs (of various breeds, ages and sizes) has been associated with development of a severe form of heart disease- dilated cardiomyopathy: (https://www.fda.gov/AnimalVeterinary/NewsEvents/CVMUpdates/ucm613305.htm). Associated diets appear to be deficient in taurine (+/- cysteine, methionine) or have increased taurine loss (due to containing high levels of water-soluble fibre). Ongoing research is working toward determining other possible dietary or dog related risk factors.For those of us who don’t speak ‘ingredient composition’ fluently, these diets are composed of peas (and likely their by-products, e.g. pea fiber and protein), lentils, chickpeas, legumes (vegetables or seeds of them), and (although less likely to be a primary culprit) potatoes. To break this down even further (and because marketing is purposefully confusing), many of the diets composed of these ingredients fall under the ‘grain-free’ banner. I could spend a lot of time talking about definitions (i.e. grain-free) and how terms like this can mean radically different things to different individuals (and pet-food companies), but that would be a lengthy (and heated) blog… so I’ll focus on the heart of the matter. This is (and should be) identifying dogs at risk from eating these diets, in order to keep them safe through prevention of a potentially fatal heart condition. 1) Do you add taurine to your pet-food? 2) Do you have pet-food on shelves for sale (right now) that was made prior to your decision to add more taurine? 3) How to I decipher the date code on your products (i.e. determine the date of manufacture), so I can figure out if your pet food was produced before (or after) your decision to add more taurine? 4) If you are aware (or suspect) that your product is potentially harmful (and know that you are being investigated by the FDA), why haven’t you issued a recall of the product? The bad news story is that no-one (i.e. the FDA, nor anyone else) has released a list of diets that are of concern or have been linked to heart disease. This leaves pet-owners (and veterinarians) unable to identify which diets are worrisome and proactively make changes (e.g. diet change, taurine supplementation, both), thus meaning extra steps (such as the questions above) are needed to identify pets at risk. 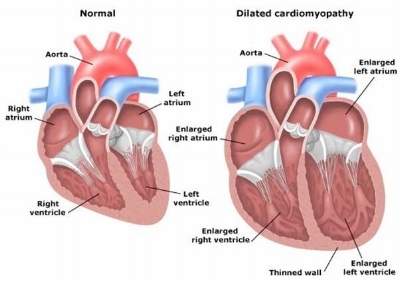 However, the good news is that this form of dilated cardiomyopathy can be treated- provided it is caught early. Asking pet-food manufacturers the questions above NOW and speaking to your veterinarian if you are concerned about your dog’s diet (i.e. the pet food manufacturer cannot answer these questions, or you’re worried about their answer) could help you help your vet save your dog’s life.